I’m not sure I can be any more excited. 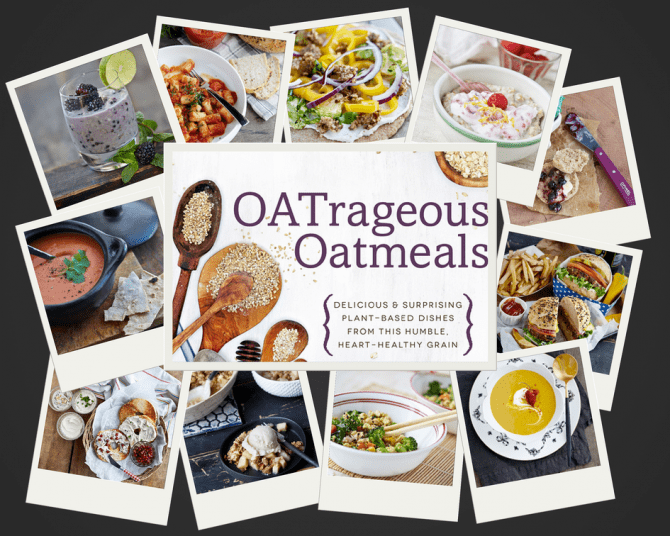 OATrageous Oatmeals finally comes out today and if you pre-ordered it maybe it’s already waiting for you at home! Today’s dreamy oatmeal recipe is actually not from the book. I’ve found when I do a single subject cookbook that it’s hard to snap out of it. My mind keeps thinking of new ideas. With the popularity of cookie butter and the DIY nut butter craze how could I not throw oat’s hat in the ring? This is basically a walnut butter that gets cut with oats, sweetened with raisins and spiced up with cinnamon. I love it on sliced apples. What’s your favorite way to use unusual spreads like this or cookie butter? When you make this your blender will smell like home-baked oatmeal cookies. The good thing is once you make this butter you can use it for a few weeks and just indulge at a little at a time. 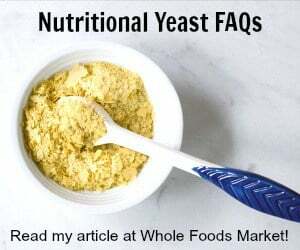 Spread it on apple slices, graham crackers or use some on top of a bowl of vanilla ice cream. 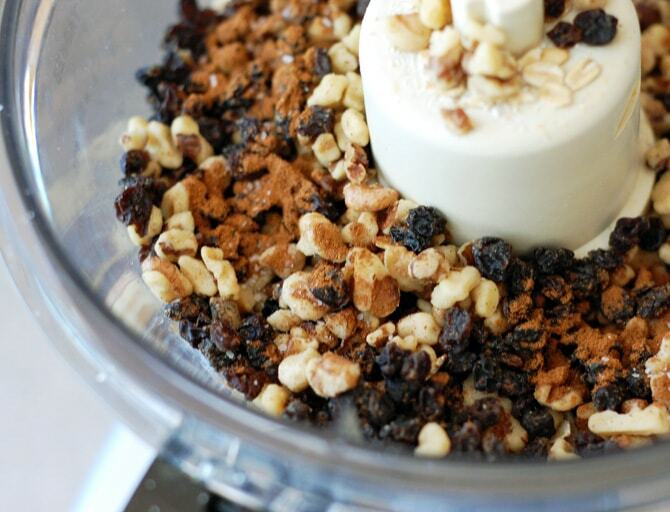 Add the walnut, oats, raisins, cinnamon, and salt to your food processor. You will need to stop and scrape the sides down a few times before the mixture gets sluggish. Scrape down the sides one more time and add in the coconut oil (or nondairy milk) 1 tablespoon at a time. If you are using the nondairy milk you may need to add a third tablespoon to get it smoother. Process until creamy. It will still have a few tiny oat and raisin flecks, but the nuts should be smooth. Store in the fridge. If you use the coconut oil the butter will get hard in the fridge, so you will need to take it out ahead of time to get it to spread smoothly on your bread. Oh man! This looks incredible. 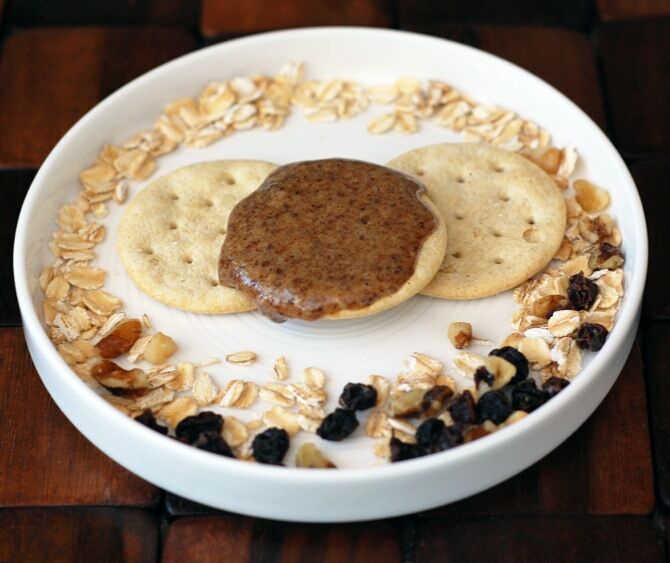 I’d never have thought to put oats in nut butter, and I can’t wait to try it. I haven’t tried it but it should work. You may need a little extra liquid or oil to get it all to blend together though. I eat overnight oats most mornings! This recipe looks great!! Where did you get that owl crock pot? I love owls and would love to own one of those!! Love it!!!!!!!!! I love that slow cooker! It’s a 3.5 quart that I picked up at Kroger’s a few years ago. I love oats in my smoothies. I like the nutty taste and creaminess they add. This recipe seems like a keeper! I think you’ll like it. 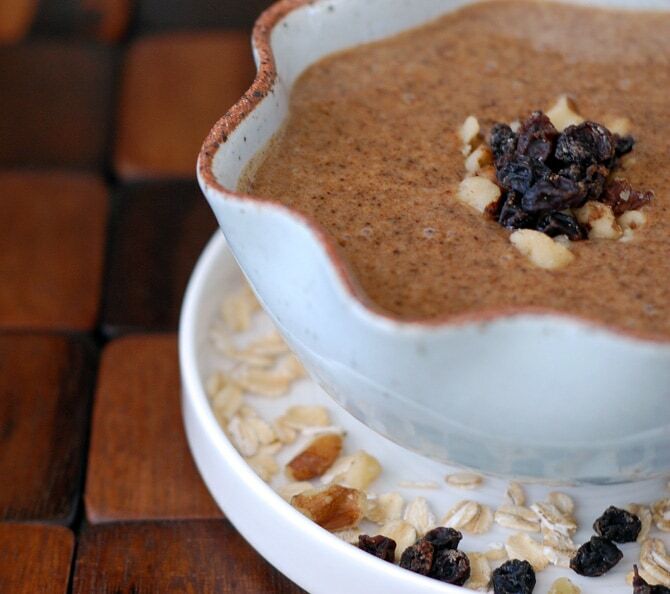 Oats are awesome in smoothies too! I LOVE overnight oats & can’t wait to make this recipe. I LOVE all types of nut butters! I could eat it by the spoonful all day long! Congrats on the book publication! Love your recipes! I love all kinds of nut butters, really, but I might lean more heavily toward a cookie butter! What’s not to love about a spread? I’m ashamed to say I never tried cookie butter. Now I have an excuse to make some. Oh man, we use oats like crazy in this house! We’re big fans of oatmeal raisin cookies, slow cooked oatmeal (seriously, waking up to a hot breakfast is pretty much the best thing ever), and we use it in a lot of our homemade veggie burgers! Going to get walnuts and try this today! Yummy! Looking forward to trying this recipe! Thanks for sharing! This looks amazing! And so much healthier than jarred cookie butter. My favorite way to eat oats is as oatmeal with nondairy milk, vanilla or cinnamon and no sugar. My favorite way to eat oats is for breakfast every morning, cooked in the microwave with frozen blueberries, cherries, and/or mango, and with cinnamon and flaxseed stirred in. Never get tired of it! I’ve never tried — or even heard of — cookie butter before, although it sounds yummy. I am a huge fan of nut butters, however (really, too big a fan!). 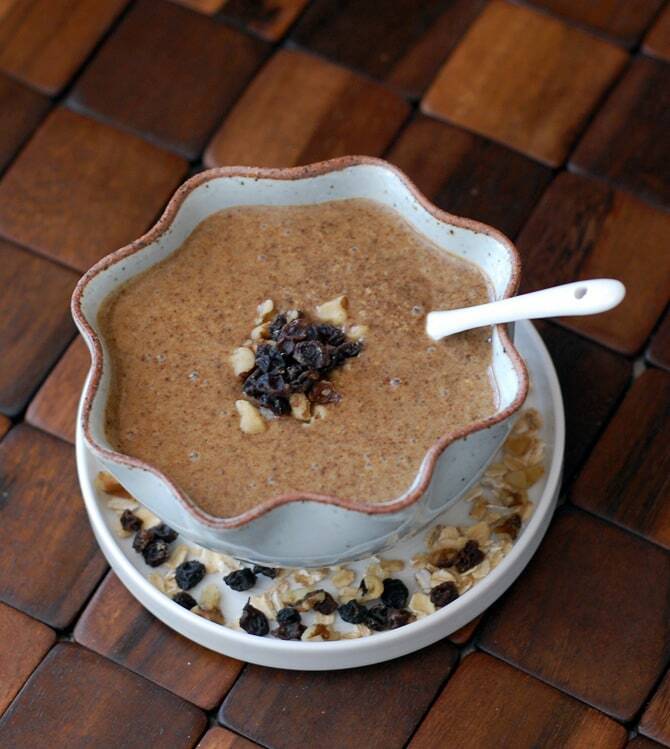 Can’t wait to try some exciting new variations on a never gets old breakfast staple….oatmeal. I just made this with my four year old, and she is smitten! She can’t wait to share it with her big sister when she comes home from school. I love having delicious recipes that can actually compete taste-wise with the junk their friends are obsessed with. Nutritionally though, this is on a whole different level. Without the added sugars and hydrogenated oils, it is actually something you can feel good about giving them on toast (or pancakes; that’s our next plan for this cookie butter!). It was very easy to make, and I replaced the coconut oil with some walnut oil. To make up for the lack of vanilla milk, I added a little vanilla extract. As you said, it did smell exactly like an oatmeal cookie when I vented the food processor! Thank you for your creative recipes! Okay – just found you today and ordered Vegan Slow Cooking for Two – now I need OatRageous Oatmeals and The Great Vegan Bean Book!